For many practitioners, navigating the insurance credentialing and billing process is a deterrent. Understanding the jargon used by insurance companies can be daunting. Many clinicians find the delay between submitting a claim, getting a status update and receiving payment the biggest barrier. Even more clinicians indicate being overwhelmed by all the various reasons a claim could be denied or rejected. 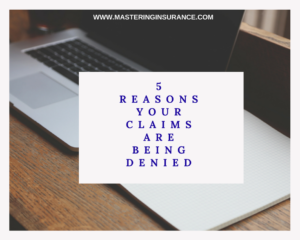 Let’s talk through 5 of the most common reasons your claims may be denied and what you can do about it. First, the client’s covered has terminated. This could happen for a variety of reasons. The obvious answer is that the client didn’t pay the premium. Equally as likely is that client failed to update the clinician that their coverage has changed to a new policy or company. Solution: File claims in a timely manner. This will allow you to catch errors or gaps sooner. You can also routinely confirm with clients that their policy information hasn’t change. Additionally, you can always periodically verify benefits by calling the number on the back of the card or by using an electronic portal like Availity or the provider portal for the designated insurance plan. Second, the policy holder information is incorrect. This could be a simple data entry error, such as, entering the incorrect date of birth. However, sometimes clients provide their information when in fact there are not the policy holder. We often need the subscribers name and date of birth in order to submit a claim. Solution: Ask a copy of the client’s card. Additionally, have the client complete an insurance release form and collect information about the client as well as the subscriber or policy holder. Third, you’ve submitted a claim for a non-covered service. One example of this is with CPT 90837 and United Healthcare. This code is routinely denied because it is considered a higher level of care which requires prior authorization and medical necessity to justify the 53+ minute Psychotherapy session. This is a common complaint for clinicians who are unfamiliar with UHCs policy regarding this CPT code and is often a surprise to many newly paneled clinicians. UHC identifies the shorter 90834 as the standard CPT code for most psychotherapy sessions. There are exceptions to this, namely sessions that integrate evidenced-based modalities such as EMDR, etc. Solution: Most contracts include exclusionary language. Unfortunately, many practitioners don’t read the lengthy and tedious contracts. A practitioner could also verify policy exclusions when verifying benefits. Fourth, the claim is not filed on time. Your insurance contract outlines your obligations as a provider and the panels obligations to you. One of the clauses most frequently overlooked relates to the time frame you have in which to submit claims. This time frame can range from 45-365 days. If you submit a claim outside of the terms identified in your contract you effectively forgo the reimbursement. You’ve essentially breached the terms of your agreement. Solution: Submit claims in a timely manner. We recommend submitting claims daily or weekly. Lastly, incorrect payor information. This can occur for a variety of reasons: you may submit the claim to the wrong payor because you aren’t aware that a carve-out (a third-party is administering a portal of the plans benefits). Other instances include not having the correct payor id and PO Box for submitting claims. Resolution: Ask the client for a copy of the back of their insurance card. This typically includes the PO Box information. When completing the benefit verification you would confirm the payor id and PO Box information. If you’re struggling with billing process or you are just getting started join us in the Billing 101 e-course. Registration is open! Limited seat available. Next Next post: To Bill or not to bill…under another providers license?